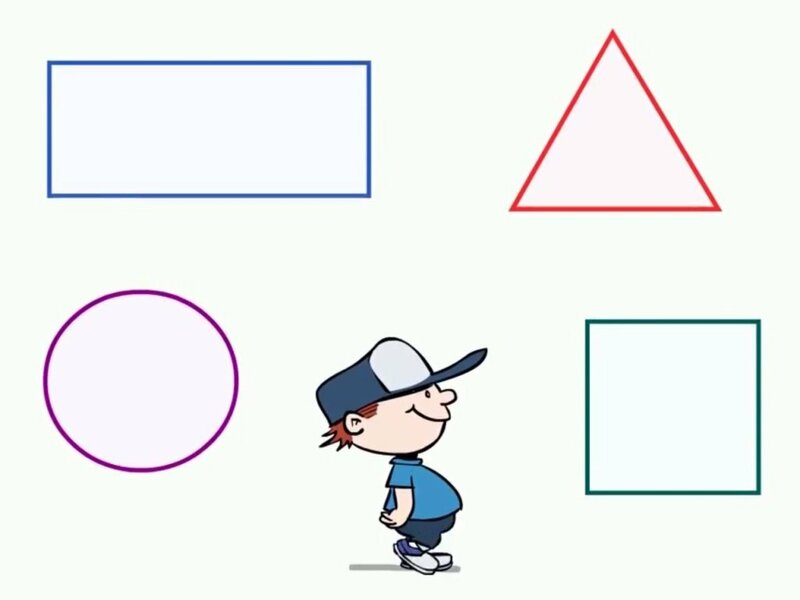 Students will be able to identify the shapes square, rectangle, and triangle. Gather your students at the group area where you have set up the projector. 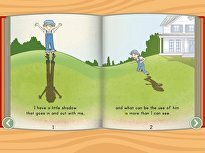 Start with a simple object that the children can easily identify and make a shadow with it. Have your students identify it. Show your students the object. Identify it verbally and visually and then place it on the projector again. Preview the lesson by introducing any new or potentially challenging vocabulary (e.g. shadow) in students' home language (L1). Review shapes and shape names with the students. 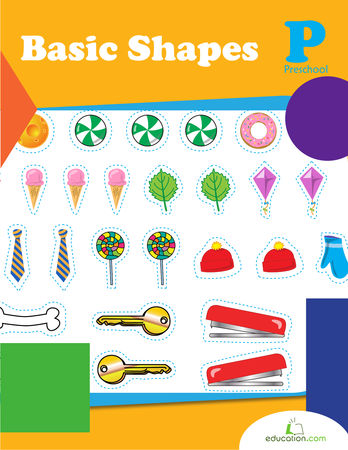 Create a visual display of different shapes and shape names for reference. Tell your students that you will be identifying shapes like you did with object that made the shadow. 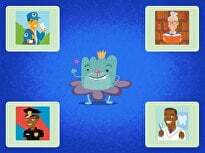 Show the students some of the different shapes and identify them as a group. 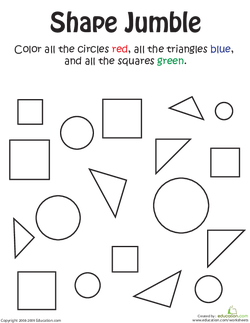 As you identify each group of shapes, point out the characteristics of the shape and pass out a shape for students to touch. Ask students to turn and talk to share the shape name with a partner. Review the qualities of the shapes. 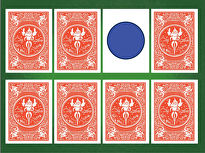 For example: "A square has four sides that are the same size." 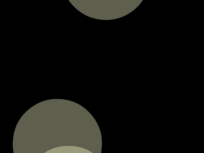 Place a shape on the shadow board and have students identify it. 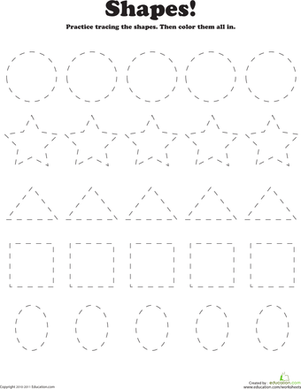 Provide students with pattern blocks or other tactile shapes to use when reviewing the shapes. Invite students to come up and choose a shape to put on the shadow board. Have students interact with the shapes and shadows. 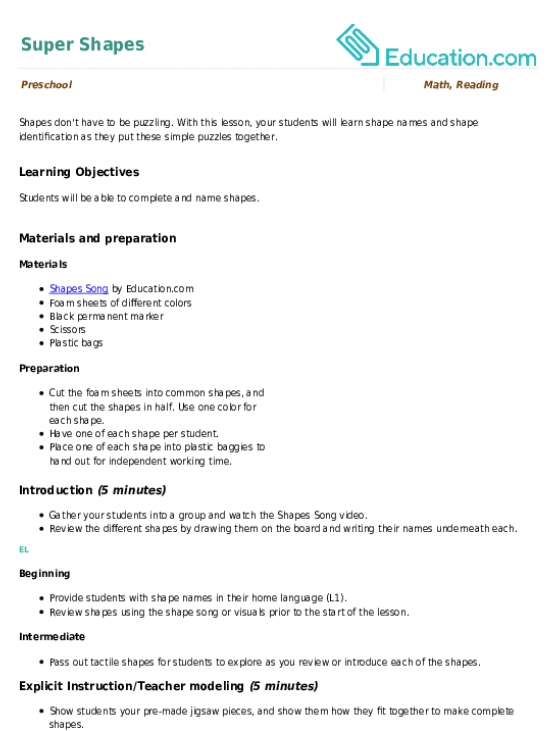 Students may construct creations with the shapes (for example, a house with a square and a triangle on top). Encourage students to work with a partner and identify the shapes they are using in their figures. Pair students together with a partner to interact with the shapes. Ask students to share with you what shapes they are using. Enrichment: Encourage advanced students to work with and identify 3D shapes, such as cylinders, cubes, and pyramids. Support: Have struggling students match different shapes that you traced onto a transparency as a review activity. Have students identify shapes as you point to them. 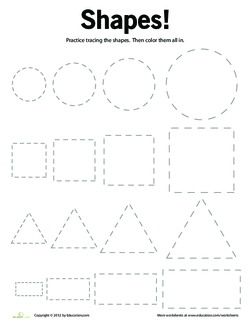 Have students complete one or more of the following worksheets: Shape Jumble, Shapes 'n' Sizes, or Tracing Basic Shapes. 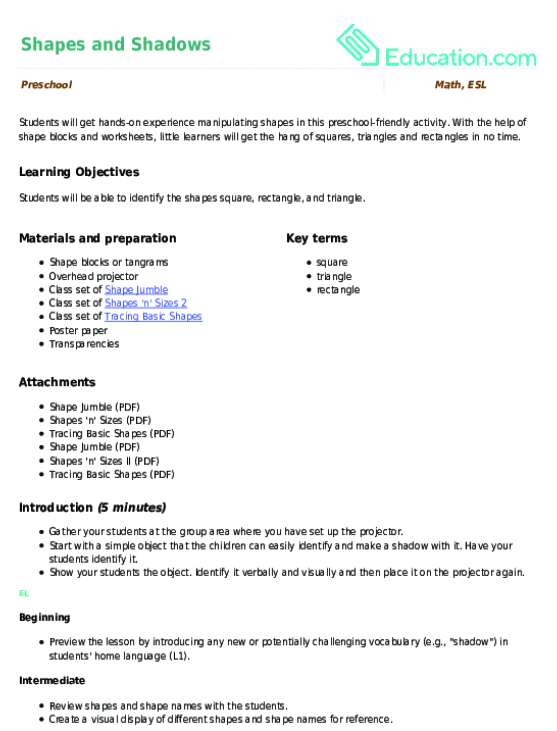 Collect the worksheets and review them later to assess students' understanding of the lesson content. Check that students are able to differentiate between shapes. Note any areas of confusion. Have students work collaboratively on a class mural by gluing the shapes onto the poster paper. Allow volunteers to label the shapes. 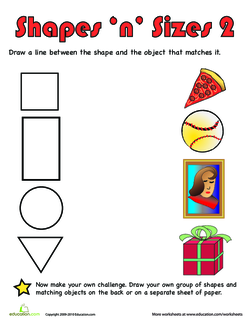 Have students work with a partner on a shared picture using the shapes. Encourage the pairs to discuss the differences between shapes. Have students share their favorite shapes. Ask students to describe their favorite shape. These toys have gotten their shadows all mixed up! Can your child match up the toy shapes? She'll be learning about patterns and sorting as she goes. Help your little one learn to recognize shapes and patterns with a fun, fishy match-up activity! She'll help these cute fish find their shadows. This animal match-up is a fun way to teach your little one about shapes and patterns! Kids trace a variety of shapes, then brighten them up with some color.